With Ultimate Factivity Collection Dinosaur, learning has never been this fun! Engaging reference notes guide you through activities, while fun challenges and interesting puzzles are designed to inspire creativity. 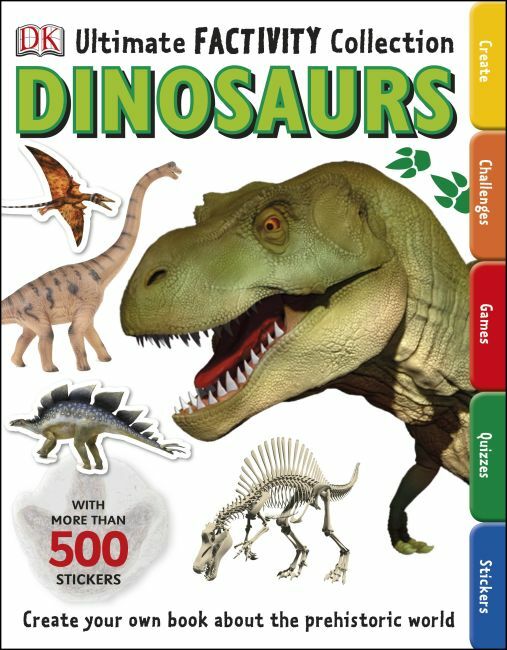 Packed with puzzles, games, doodles and over 500 stickers to accompany amazing facts and information. Dig yourself into this wild world of prehistoric creatures and tackle activities on the terrible T.Rex, the stout stegosaurus, the giant brachiosaurus, and more. Go on an a-"maze"ing adventure, make an origami dinosaur, or hunt for fossils in this incredible, fact-filled adventure. The combination of fun activities and educational information will help improve your child's social, emotional, cognitive, and language skills - and they'll have fun while doing it! Take a trip back in time with Ultimate Factivity Collection Dinosaur.